The Archives and Special Collections of Morgan Library serve the mission of Grace College & Seminary by collecting and preserving materials to provide a historic testimony for a contemporary faith. It serves as the repository of churches and agencies of Charis Fellowship and also houses materials relevant to the community of Winona Lake, Indiana. Photocopying and digital scanning is permitted if physical condition and copyright allow. Copy machines are located on the main floor of the library. Photocopies are 10 cents per page, and digital scans completed by Morgan Library staff are $15 per scan. Mail, email and telephone requests are handled fully as time permits. Photos and documents from Morgan Library's archival collections have been digitized and are available to the general public. These photos, postcards and documents contain rich historical significance. You may view the digital representations of those collections online. The Grace Digital Library contains images, newspapers, postcards, and many other archival objects that have been digitized for sharing Grace College & Seminary and Winona Lake history with the world. The Sounding Board is the student newspaper for Grace College & Seminary. The first edition was published in May 1954. This collection, when complete, will include all available print copies found in the archives of Morgan Library. The Winona Lake Postcards Collection consists of several hundred postcards depicting Winona Lake from the early 1900s to the 1970s. The Winona Panoramic Images Collection includes Brethren Church and Free Methodist Church Conferences, Billy Sunday Campmeeting, Rodeheaver School of Music, Camp Winona men and many others. The Winona Railroad Collection includes images and a variety of memorabilia related to the history of the interurban railroad in northern Indiana. 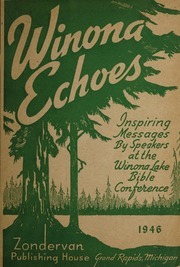 The Winona Echoes provide the text of many of the messages presented during the sessions of the Winona Lake Bible Conference held each summer for many years in Winona Lake, Indiana. Thousands thronged to Winona Lake to hear famous Christian speakers and the Winona Echoes made the addresses available for attendees to read and enjoy following the conference. The publications start with 1902 and end in 1947. A couple years are missing unfortunately, in the early years but for the most part, the collection is intact. The following guides, sometimes called "finding aids", describe the contents of individual collections housed within the archives and special collections at Grace College & Seminary. The materials in these collections are either located in the Morgan Library or at the Winona History Center in Westminster Hall. They have not been digitized and require on-site research visits. Processing our materials is on-going, and new collection guides will be made available as they are ready. Morgan Library’s Archives and Special Collections are open by appointment Monday through Friday from 8:30 a.m. until 5:00 p.m. Staffing is usually not sufficient to provide research assistance to researchers during evening and weekend hours unless by special request. Researchers coming from a distance should contact the library in advance. Mail, email and telephone requests are handled fully as time permits. Numerous theses, scholarly articles and published books have been completed with extensive use of Morgan Library’s collections. Permission must be obtained to publish excerpts from archives and special collections materials, as determined by the depositor of materials. Researchers are responsible for determining U.S. copyright law status of materials. Morgan Library is a partner of the Brethren Digital Archives, an organization that seeks to digitize periodicals of each Brethren body that traces their origin to the baptisms of Alexander Mack and his friends near Schwarzenau, Germany in 1708. Among the Grace Brethren related publications slated for publlication are the Brethren Missionary Herald, the Grace Seminary Spire and Grace Theological Journal. The following bibliographies provide information about primary resource guides, published campaign pieces, collected sermons, biographies, dissertations and theses about William A. (Billy) Sunday and his wife, Helen (Ma) Sunday. Most of the resources listed are available at Morgan Library.